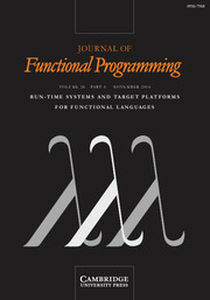 Journal of Functional Programming is the only journal devoted solely to the design, implementation, and application of functional programming languages, spanning the range from mathematical theory to industrial practice. Topics covered include functional languages and extensions, implementation techniques, reasoning and proof, program transformation and synthesis, type systems, type theory, language-based security, memory management, parallelism and applications. Special tracks are devoted to tools and applications, commercial uses and education; pearl-type papers are encouraged. The purpose of this special issue is to recognise and encourage the publication of mature research contributions in this area.